My laboratory works on the molecular genetics of two developmental sensory systems: the eye and the ear. We seek to understand the genes required for the formation of early retinal tissue during eye formation and in the development of specific relay centers in the auditory brainstem that are critical for hearing. Using transgenic and targeted deletion (knockout) mouse models, the lab is studying the function of specific transcription factors in regulating developmental gene expression patterns and deciding the fate of these particular tissues. These studies use molecular, genetic, and biochemical techniques—along with fluorescent and histochemical imaging—to understand how genetic mutations affect the formation of sensory organs. We have developed genetic models that allow us to delete a gene at selected times, allowing a detailed analysis of that gene's function at various stages of development. We have also used mutational screens in patients to identify a cause for anophthalmia, a condition where patients are born without eyes. Our current work with stem cells is aimed at repairing damaged sensory tissue through regeneration. Figure: Conditional Gene Deletion During Development. 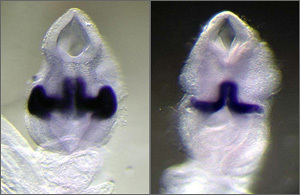 Mouse embryos stained for Rx gene expression. A) Normal embryo showing Rx expression in the optic vesicle and ventral forebrain. B) Cre-recombinase-expressing embryo, where Rx exon 2 is deleted only in the optic vesicle. Note the loss of expression at the lateral surface. Deletion of Rx at this stage prevents the neural retina and lens from forming, showing that Rx is required to specify these important visual tissues. Rx is also necessary for the initial formation of the optic vesicle. Rodgers HM, Huffman VJ, Voronina VA, Lewandoski M, Mathers PH (2018). The role of the Rc homeobox gene in retinal progenitor proliferation and cell fate specification. Mechanisms of Development, in press. Marrs GS, Morgan WJ, Howell DM, Spirou GA, Mathers PH. Embryonic origins of the mouse superior olivary complex. Dev Neurobiol, (2013 May) 73(5): 384-98. doi: 10.1002/dneu.22069. Lu F, Kar D, Gruenig N, Zhang ZW, Cousins N, Rogers HM, Swindell EC, Jamrich M, Schuurmans C, Mathers PH, Kurrasch DM. Rax is a selector gene for mediobasal hypothalamic cell types. J Neurosci (2013 Jan 2) 33(1): 259-72. doi: 10.1523/JNEUROSCI.0913-12.2013. Belcastro M, Song H, SInha S, Song C, Mathers PH, Sokolov M.Phosphorylation of phosducin accelerates rod recovery from transducin translocation. Invest Ophthalmol Vis Sci (2012 May 1) 53(6): 3084-91. doi: 10.1167.iovs.11-8798. Hoffpauir BK, Kolson DR, Mathers PH, Spirou GA. Maturation of synaptic partners: functional phenotype and synaptic organization tuned in synchrony. J Physiol. (2010), Epub ahead of print. Hoffpauir BK, Marrs GS, Mathers PH, Spirou GA. Does the brain connect before the periphery can direct? A comparison of three sensory systems in mice. Brain Res. (2009),1277:115-29. Fancy T, Mathers PH, Ramadan HH . Otitis media with effusion: a possible role for Helicobacter pylori? Otolaryngol Head Neck Surg. (2009),140(2):256-8. Howell DM, Morgan WJ, Jarjour AA, Spirou GA, Berrebi AS, Kennedy TE,Mathers PH. Molecular guidance cues necessary for axon pathfinding from the ventral cochlear nucleus. J ournal of Comparative Neurology (2007), 504(5):533-549. Hoffpauir BK, Grimes JL, Mathers PH, Spirou GA. Synaptogenesis of the calyx of Held: rapid onset of function and one-to-one morphological innervation.Journal of Neuroscience (2006), 26(20):5511-23. Ma Y, Hu H, Berrebi AS, Mathers PH, Agmon A. Distinct subtypes of somatostatin-containing neocortical interneurons revealed in transgenic mice.Journal of Neuroscience (2006), 26(19):5069-5082. R ao AK, Mathers PH, Ramadan HH. Detection of fungi in the sinus mucosa using polymerase chain reaction. Otolaryngology—Head and Neck Surgery( 2006), 134(4):581-585.